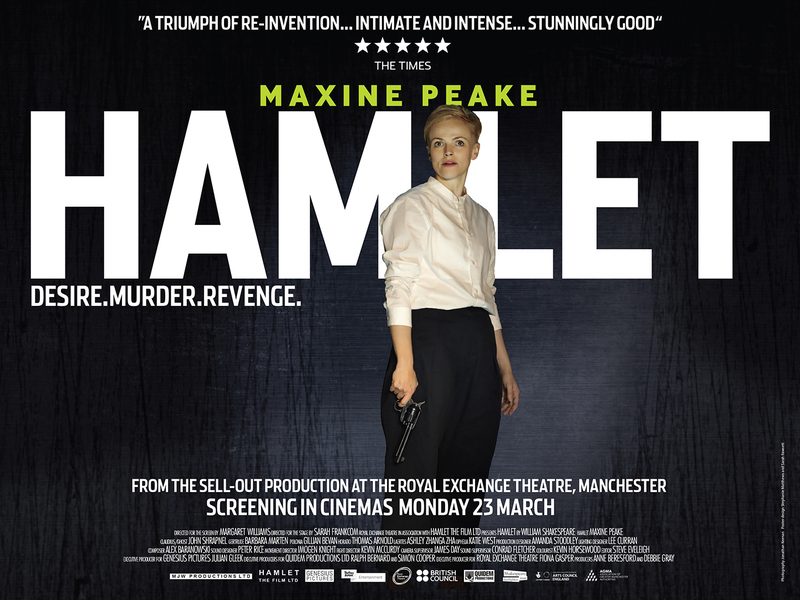 March 2015 sees the cinema release of Maxine Peake as HAMLET, the film of Sarah Frankcom’s acclaimed production of HAMLET at the Royal Exchange Theatre, Manchester. The compelling stage-to-screen film, directed by Margaret Williams (Peter Grimes on Aldeburgh Beach, One Man Walking), sees Maxine Peake (The Theory of Everything, The Village, Silk) in the title role of Shakespeare’s iconic play, in which Hamlet, consumed by despair, struggles to exact revenge for his father’s murder, with devastating consequences. The film is distributed by Picturehouse Entertainment and will open in nearly 300 cinemas and counting in the UK on Monday 23rd March 2015. The strong, poignant production depicts intense family drama and the power of grief. Maxine Peake’s fierce and textured Hamlet imbues the role with anger, indignation and purpose. Filmed with eight cameras by an expert team, the film captures the intensity of the stage production with all the polish and care of a feature film. Right from the beginning of this production it felt like a thrilling opportunity to explore, excavate and interrogate something with Maxine Peake, the most fearless and most courageous actor that I’ve ever worked with. Directed by award-winning Artistic Director of the Royal Exchange Theatre Sarah Frankcom (Masque of Anarchy, Punk Rock, A View from the Bridge), the Royal Exchange Theatre’s stage production of HAMLET played to sell-out houses throughout its run. This stripped-back, fast-paced version, with moments of humour, is a captivating production that rebalances the gender casting. HAMLET received four- and five-star reviews across the board. Maxine Peake was BAFTA-nominated for her performances in both Hancock and Joan and The Village, and is hugely respected for her performances in Red Riding and as Myra Hindley in See No Evil. She has a long relationship with the Royal Exchange Theatre and is now an Associate Artist. Earlier this year, her play Beryl was performed at West Yorkshire Playhouse. The strong supporting cast includes John Shrapnel as Claudius/Ghost (Phedre, with Helen Mirren at the National Theatre; Macbeth, with Kenneth Branagh, 2016), Barbara Marten as Gertrude (The Mill, Vera), Gillian Bevan as Polonia (London Road, Teachers), Katie West as Ophelia (Without You and the Royal Exchange productionPunk Rock), and Thomas Arnold as Horatio (Call the Midwife, Wolf Hall and Endeavour). The film is produced by Anne Beresford (MJW Productions) and Debbie Gray (Genesius Pictures), who both produced Peter Grimes on Aldeburgh Beach. Debbie Gray had major success in 2014 with the BAFTA-nominated film Northern Soul, which reached number ten at the UK box office and number one in the DVD chart. Anne Beresford is known for her work in music and arts as well as on feature films including Mouth to Mouth starring Ellen Page.